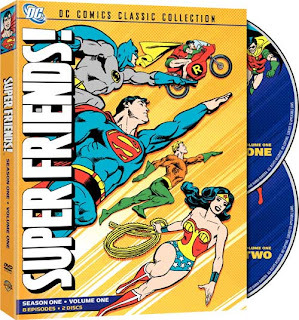 I just finished watching the first half of the recent DVD release of the Super Friends that my loving wife picked up for me. This is the actual first season of the Hanna-Barbera TV series. 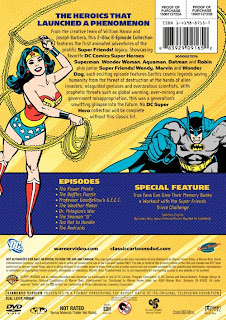 Other releases have claimed to be the first season, like The Challenge of the Super Friends. Technically, I guess it was the first and only season under that title, but I considered every incarnation a part of the regular run of the series. The opening theme to this season of the Super Friends is one of my favorites. 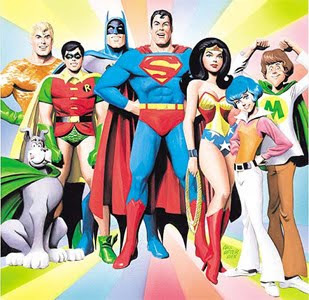 The Challenge of the Super Friends intro would be the other. It had been awhile since I had seen these episodes, but I still remember the gist of the majority of the stories. I always liked Wendy and Marvin too. I wish they would have had an explanation of what had happened to them when Zan and Jayna took their place. There were 16 episodes in the original run of the first season. The newest DVD set has only the first 8. I guess that means there will be a Volume 2. I never thought of the show as educational, but there many educational facts like the water mass of the earth sprinkled throughout the episodes. If you loved this season as a kid, you'll at least like it for the nostalgia now. Funny thing is I was watching this with my 5 year old nephew and he asked me, Why is Batman wearing blue and gray? Damn I feel old. Don't you wish they had actual villains from the comics in this season? For more Super Hero DVDs check us out.